Garbage disposal service in the City of Springfield is being upgraded to a cart-based system. River View Sanitation supplied garbage cans will be delivered to residences in Springfield the week of December 3-7. Approximately 1,000 garbage cans will be delivered to residences; but, because of the amount of cans to be delivered, it is unlikely that all homes will receive the new cans next week. If not next week, the cans will be delivered shortly thereafter. 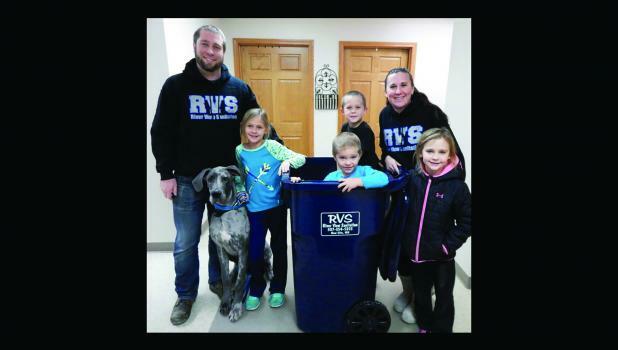 Residents may use their new RVS garbage can immediately. Garbage and recycling services will move permanently to the streets starting December 3. The residential heavy-duty 65-gallon trash cans are equipped with wheels and attached lid. Residents are asked to bag their garbage as usual and place in the cart and wheel to the curb. River View Sanitation will continue the usual pickup schedules. Recycling will also remain on the usual schedules. Collection of garbage will be done curbside. There will be no pickup in alleys. River View Sanitation is upgrading trucks to larger and heavier trucks equipped with cart tippers. Many alleys in town will not accommodate the larger and heavier trucks. The drivers will no longer be manually lifting cans. “It will be nice for customers, too,” Kucera added. Rolling a wheeled car to the curb is easier than carrying a bin or, in many cases, multiple bins to the curb. The carts are well engineered with a low center of gravity for stability. “If a can breaks, we’ll replace it for free,” he said. Recycling will continue as usual. A different truck will collect the recycling. The red cans will still be used, and when replacements are needed, those cans will also be replaced free of charge. “Our goal is to eventually get all matching cans,” Kucera said. Residents of all households should look for an informational sheet in/attached to the garbage cart, read it and be informed.